Probably, the actual name should have been the “Target” of many colors. Joseph was Rachel’s oldest–she died when Benjamin was born. Israel loved Joseph. He was obedient, loved God, loved his family and generally pleased his dad. Not so much with the rest of the clan. They were older and had their own families. They had shown on at least one other occasion that they would do what they deemed right–no matter the advice of their father. So in light of the jealousy, the coat and Joseph’s dreams; poor Joseph was not on the list for “brother of the year”. It would have been a great deal more safe for him to keep a low profile; and, simply keep what God was showing him to himself. In the grand scheme of life, however, well, it simply would not have mattered. Joseph’s coat was not the target–it was his relationship with his father and Heavenly Father–that was the true target. In our lives, when we chose to follow God closely and humbly–it was as if, we too, put on a coat of many colors, The enemy sees we choose to allow God to prepare, protect and provide for our life and needs. Our desire to please God impacts the world in the same way the coat impacted Joseph’s brothers. It is why Paul urges us to put on the full armor of God (I Corinthians 6)–to protect us from our enemy. He prowls like a roaring lion (I Peter 5) seeking whom he WILL devour. Unless we are battle-ready and battle-tested, the enemy will take us down. Still, no matter what our preparation and intent–be ready for God’s plan to pull us in directions we would never have imagined. He is God–We Are NOT!!! Trust and follow him, and enjoy the coat, no matter what the color! Every great superhero story starts with a young protagonist, minding his own business when, circumstances well outside their control impact and change his life. Joseph was, by all accounts, a superhero. He was the favored son of Israel. Rueben, Israel’s oldest son had an affair with one of his father’s concubines. That destroyed their relationship. So Joseph, Rachel’s oldest son was clearly his favorite. God gave Joseph the ability to dream and see the future. Joseph, was pleased and shared it with his dad and his dad and his siblings–So started the adventure. Between Israel’s love and favoring Joseph, and his brother’s jealousy and rage–it was clear things were going to get difficult for Joseph. For now however, Joseph was loved, blessed and devoted to God with all his heart. He was content to simply listen and follow. We, like Joseph, have the ability to simply move forward and follow God. We do not know what all lies ahead in our future, we just know that our Father in Heaven holds the future and his plan for our lives. While God’s plan is not easy to discern, his promise is. “I know the plans I have for you, says the Lord. Plans to prosper you and not harm you; plans to give you a hope and a future.” Jeremiah 29:11. We have to follow God’s lead–both with humility and grace. We only know the end–we have to trust him for the journey in between. We can rest assured, that, if we will–the journey will be an amazing one! Once again Israel’s young life had been turned upside down. After the attack upon his daughter and the slaughter of the Canaanite’s that were responsible, God called Israel to purify and start again. So it says that everyone got rid of their personal idols and they resettled in Bethel, the place where God and Jacob wrestled and God changed his life. As they traveled, The other locals were afraid and no one dared pursue them as a people. Once again, God prepared, protected and provided for his chosen people. When they arrived, they set up an alter and a memorial; and there they worshipped God. When our lives get turned upside down, we should also follow the model. We need to purify our lives by simply evaluating and acknowledging what personal idols do we house. Then as we identify them, we, like Israel, must walk away from them and worship God and him only. Then, we need to go back to where we started and worship God as we did when we began our relationship with him. As we do, we will experience his peace and power in our lives. Our enemies will fear us, and we will see a shining pillar of his presence in our lives…Not a bad trade. Help me, Lord to exchange my idols for your peace and freedom. 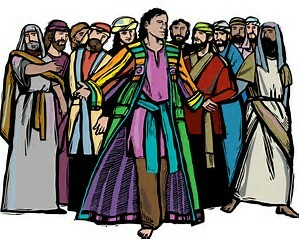 Then God said to Jacob, “Go up to Bethel and settle there, and build an altar there to God, who appeared to you when you were fleeing from your brother Esau.”2 So Jacob said to his household and to all who were with him, “Get rid of the foreign gods you have with you, and purify yourselves and change your clothes. 3 Then come, let us go up to Bethel, where I will build an altar to God, who answered me in the day of my distress and who has been with me wherever I have gone.” 4 So they gave Jacob all the foreign gods they had and the rings in their ears, and Jacob buried them under the oak at Shechem. 5 Then they set out, and the terror of God fell on the towns all around them so that no one pursued them. Horrific can never be OK. Dinah goes out to meet the ladies in the area–The Prince sees her and takes and rapes her. Then he thinks I like this one. After the attack, he thinks…She’s awesome, I want to marry her! He and his dad bop over to Israel and seek his permission to bring son and daughter together in marriage. In fact, to simply become one big happy family. Everybody wins, right…But wait she was raped!!!!! When a culture is godless, the value of life and others is minimalized and self interest is made king. Hamor and Sheckem saw the attack as an opportunity to merge the peoples–Jacob and his family saw this horrific and deplorable act as an act of war.y these men demonstrated their lack of respect for life, for others and for God. As such, The boys wiped Hamor, Sheckum and the tribe out. Israel was upset that it might hurt neighborhood relations,,,what?!?! That is why God was clear–Israel was to remain separate from the Canaanites. We may not be able to choose where we live, but we can choose how and with whom we live. We have to live with Christ as our lead and his standards as ours. Selfless; not selfish. We value life and others–we don’t simply use them. Further, we cannot look at others that abuse and exploit the lives of others and think, Awe, that is just how they are. We shall never approve of those that self-absorbed and abusive. Such actions cannot ever be excused or adopted as our life. We have to remain Godly and expect that of all with whom we interact. Be Holy as God is Holy! So, life in the new nation–Israel had begun; not in the way one would usually see the birth of a nation, but, instead–a true and organic nation built by the birth of a family. God changed it’s patriarch from a deceiver, to the chosen leader of the nation. And the leader bought land on which to settle. Unlike his grandfather before, Israel came to settle and grow. His sons were establishing their own families, and for the first time since Terra settled in Haran, the people were settling in. It was a strange sense for them, but, they had no idea, that these simple steps, would set in motion our ability to know and be known by God. God made the covenant, first with Abraham, the again with Israel that all nations would be blessed through his family—we can affirm that that covenant is true. A world that knows about God; and people in every nation that are in relationship with God wave as a glorious banner to the fulfillment of God’s original covenant. We, should wake each morning truly grateful for that covenant. We should recognize that we are, by spiritual adoption, a beneficiary of that covenant. With that, we should never hesitate to be a part of the execution of God’s plan to fulfill that covenant. In my life, each morning—I am confronted with the very proposition, how is the world being blessed through me? Most days, the answer truly remains a question mark. But, like Israel as he settled in, we have no idea how God intends to use us, our families and those in whom we pour our lives. In the early 20th century, a tent revival preacher was coming to the end of his ministry. He knew the end was near, because people were no longer coming to the tent in mass, and those that came, were not being moved as they once had. Yet, as the week was drawing to a close, the old preacher gave the invitation and after several verses, only one person came forward to start a relationship with God. Dejected, the old preacher tossed in the towel and retired. What that evangelist did not, or could not have known–was that the person that came forward that night was none other than Dr. Billy Graham. We remain faithful–then allow God to make the difference. Well, the time had come. Jacob had to face the music–as he approached his old home, there marched Esau and his 400 fighting men…actually, at this point, the story becomes “dramatically” anti-climactic, Esau runs up, hugs Jacob and invites him home for dinner. Further, he only accepts the gift from his brother after Jacob insists several times. Finally, He allows Jacob to get settled in his time and way–no pressure, what so ever–pretty snoozy, story. God came before and prepared the way for ISRAEL’s return. Now, Israel’s dread behind him, he could focus upon being where God wanted him to be and raising his family to honor God and become the nation of priests–for which they were called. In a nutshell, there was nothing in the Jacob’s life that could not be handled if properly left in God’s hands. Sound Familiar? Jacob looked up and there was Esau, coming with his four hundred men; so he divided the children among Leah, Rachel and the two female servants. 2 He put the female servants and their children in front, Leah and her children next, and Rachel and Joseph in the rear. 3 He himself went on ahead and bowed down to the ground seven times as he approached his brother.4 But Esau ran to meet Jacob and embraced him; he threw his arms around his neck and kissed him. And they wept. 5 Then Esau looked up and saw the women and children. “Who are these with you?” he asked. It seems that when all is going well, people tend to accept the status-quo. However, when life turns upside down and the wheels fall off–then we start planning, praying and wrestling with God. Such was the case with Jacob. He had been in the employ of his uncle/Father-in-Law for the last 20 years. He had 2 wives, 2 maidservant wives and 11 kids. God blessed him with tremendous wealth in livestock and supplies and he literally had the world by the tail. Then, things turned dark at Uncle Laban’s and it was time to go home. As he approached the land of his youth, his brother–from whom he stole the birthright and blessing–heard of his approach, and sent 400 men to meet him, there stood Jacob, upside-down and wheeless!! Jacob did what we do, he wrestled with God, his promises and his plans. Jacob and God wrestled through the night, then at daybreak, God blessed Jacob–he changed the man he was–“The Deceiver”, to the “Chosen man of God”–Israel! From that time until now, Israel has been distinguished from all other peoples; just as Jacob had been set apart from all other dads. Israel was now the patriarch of a nation–not simply a father of a rag-tag family. Like Jacob, we also find that, in the times when we are most dependent upon God for our very survival–we tend to have our greatest impact. It is when we can focus on God–not on ourselves and/or what we possess, that we can see him bless us in ways the world could never imagine. It is not that we should pray to be turned upside down, it is simply learning to look to him first and always when those times come. Then as we seek him and his blessing, understand, that is what he wanted to do all along. In Psalms 37:4 it says, “Delight yourself in the Lord–and he will give you the desires of your heart!” Israel would soon see, no truer verse had ever been written!